MANILA, Philippines – Professional Regulation Commission (PRC) released the schedule of board exams for the year 2019. This includes the opening of online processing, deadlines of processing of applications, target dates of release of examination results and schedule for Special Professional Licensure Examinations (SPLE) in Middle East. The schedule consists of detailed programs from January to December 2019 of the following regulated professions; Criminologist, Dentistry, Electrical Engineering, Civil Engineering, Architects, Pharmacist, Midwifery, MedTech, RadTech, Psychologist, Librarians, Agriculturist, Fisheries Technologist, Interior Designers, Custom Brokers, Physicians, Nursing Licensure Exam (NLE), Licensure Exam for Teachers (LET), Certified Public Accountants (CPA), among others. PRC added that the schedule for SPLE to Overseas Filipino Workers (OFWs) shall be scheduled in accordance to PRC Resolution No. 2017-1034, RA 8981 and Executive Order No. 835. The filing of application, along with all supporting documents at the Central and Regional Offices shall be within period indicated in the schedule. If the deadline of filing falls on legal or regular holidays and non-working holidays, the deadline will be on the immediately succeeding working day. No changes in schedule will be made without prior approval by the Commission. Professional Regulatory Boards are further advised that their duties and responsibilities pertaining to the conduct of board exams shall take precedence overall their other functions. 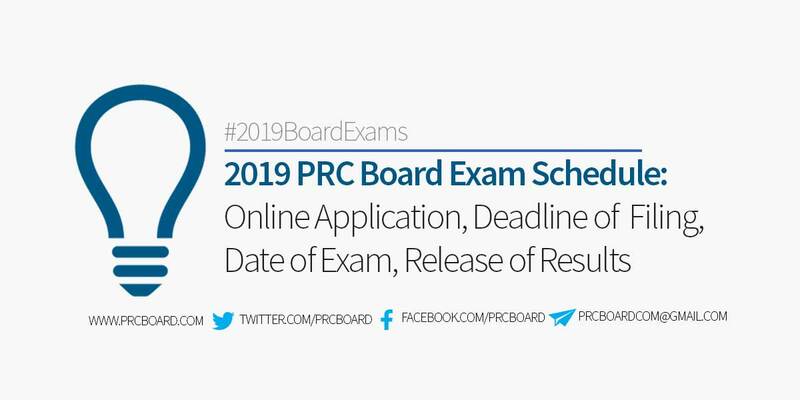 Below is the complete list of PRC board exam schedule 2019, courtesy of PRC. To continuously receive further updates about PRC board exams for the year 2019, online registration, coverage of examination, release of results, among other announcements, kindly follow us at our social media accounts via Facebook and Twitter. pano maka register online under maintenance pa rin ang website ng prc for online applications. May opening slot naba para rme? Pwd naba mag online registration? wala na po ba extension ang filling for criminology licensure examination?